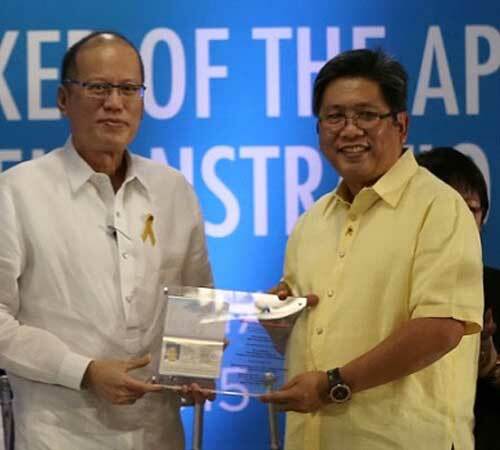 AQUINO GOVT’S P38B PASSPORT-PRINTING CONTRACT: THE BIGGEST CASE OF CORRUPTION EVER? THE only other explanation for this highly anomalous contract is that former President Aquino 3rd and his officials were so stupid beyond belief that they handed over to a private firm the lucrative monopoly to print the country’s new electronic passports. That contract will generate for the company an income of at least P10 billion in the 10 years that started mid-2016. The scheme was planned and the contracts signed in 2014. However, actual printing of the passports under the anomalous set-up started in July 2016 right after President Rodrigo Duterte assumed office. If he doesn’t stop the contract though, he will undoubtedly be blamed for it, even for just allowing such a scandalous rip-off to continue. I was told that in 2017 then Foreign Affairs Secretary Perfecto Yasay Jr. and Presidential Communications Operations Office (PCOO) Secretary Martin Andanar have asked Executive Secretary Salvador Medialdea to recommend to Duterte that the contract be rescinded. The recommendations were unacted on, though. Former foreign affairs secretary said he was aware of the issue, but had been told that it was being dealt with by the executive secretary. Not even during Ferdinand Marcos’ 13-year strongman rule did government hand over to so-called “cronies” such a huge moneymaking contract, secretly and without public bidding. The passport printing contract — which the Commission on Audit said involves P38 billion in sales of passports to the foreign affairs department in 10 years — dwarfs the other anomalous deals the previous Aquino regime undertook, among them the P3-billion purchase of the defective Dengvaxia vaccines or the P5-billion MRT-3 maintenance contracts that failed. Aquino officials in late 2015 gave the go-ahead to print the new so-called hi-tech “e-passports” with readable biometric chips to a purported joint venture (JV) between the government-owned APO Production Unit (APO-PU, which was under the PCOO) and United General Expression Corp. (UGEC), an unremarkable printing outfit. The printing of the passports by what was called the APO-UGEC Security Printing Joint Venture started in July 2016. It later turned out that UGEC’s biggest stockholder with 30 percent of UGEC is reportedly the family (through E. Zobel Inc.) of billionaire Iñigo Zobel — the country’s 11th richest billionaire with a $2.5-billion net worth, according to the Forbes magazine roster. However, 10 percent of the firm was reported to be held by Haldane Investments, a rather shadowy firm based in the tax-haven country of Vanuatu. Zobel hasn’t responded to that report, published in this column and in another newspaper. It would be interesting to find out who the other stockholders of UGEC are. It is not clear when Zobel and Haldane invested in UGEC, which had been controlled by an obscure businessman from Malabon. There was no public bidding at all for what company would be APO-PU’s partner, and the creation of the JV was practically kept secret — until now. The JV and APO-PU’s partner were not reported in its published annual reports nor in its website which portrayed its high-security printing plant that was operated by the JV as entirely an operation of the APO-PU. UGEC in its website does not even mention what has been its biggest moneymaker, the printing of the e-passports. The JV is a total farce, intended to skirt government regulations that the passports must be printed directly only by three state firms (other than APO-PU, the National Printing Office, and the Bangko Sentral ng Pilipinas). The Commision on Audit (COA) in 2016 even pointed out that the JV’s printing of the passports violated the Government Procurement Policy Board’s Resolution 26-2015, which categorically “required the APO-PU to directly print the electronic passports.” It demanded that the JV contract be amended. The APO-PU ignored the COA. The JV is hardly a joint venture in that APO-PU’s share in the enterprise’s capital was just 10 percent, made in kind as the valuation of its leasehold rights to the property where the JV housed its printing plant. 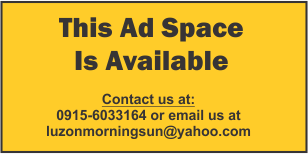 The COA, however, even pointed out that this was anomalous as this represents only 10 percent of the value of APO-PU’s lease over the 10-year period of the contract. The distribution of the JV’s profits tears apart the disguise that is it is a joint venture. Under the JV’s 10-year contract, UGEC would receive 90 percent of annual profits if these are below P600 million; 80 percent, if these amount to P600 million to below P900 million; and 70 percent if P900 million and more. The JV’s profits amounted to P82 million in 2015, P223 million in 2016, and P468 million in 2017. The COA pointed to the huge anomaly in such profit distribution: “APO’s contribution in the form of a captured market was not considered especially as it was one of the three state printing enterprises allowed to produce the passports.” In short, why would UGEC get 70 to 90 percent of the JV’s profits if without APO-PU, it could not supply the captured market the COA estimated to be worth P38 billion? The profit distribution meant super-profits — a feature of any monopoly — for UGEC. 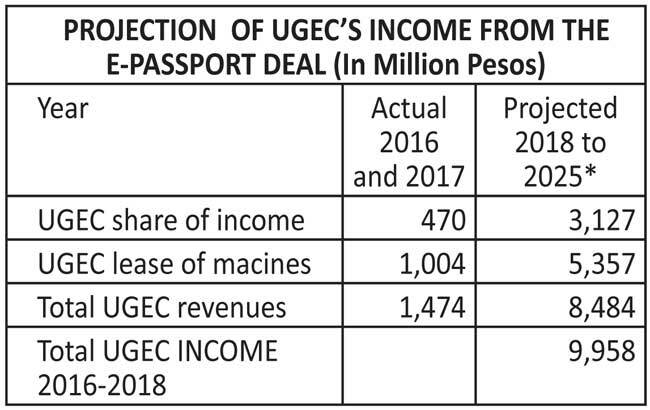 According to the COA, in 2015 (when the JV printed only BIR and DTI forms), and then 2016 and 2017 (when it printed the passports), UGEC had revenues from the deal totaling P543 million — more than double its P193 million investment. But, UGEC’s revenues didn’t come only from its huge shares of the JV’s profits. The COA discovered that the JV was leasing from UGEC for P670 million per year the machines it was using. Including those lease revenues, UGEC’s profits totaled P1.4 billion for 2016 and 2017. UGEC’s share of profits will be increasing in the remaining eight years of its contract as over 40 million Filipinos get the new e-passports, which had boosted the JV’s sales P139 million in 2015, to P1.7 billion in 2016, and P3 billion in 2018. If we make the conservative assumption that UGEC’s income will be increasing only by 5 percent every year in the next eight years, from P327 million in 2017, and its revenues from leasing it machines to UGEC remain constant, how much will it have earned at the end of the contract, including its lease of the JV’s machines? A staggering P10 billion (see table). That dwarfs any contract given without bidding by government to any firm in our history. That mammoth income of course would be at a cost to the 40 million Filipinos who paid or will pay for the new e-passports. If Iñigo Zobel is really UGEC’s main owner, he’d likely be bumped up to rank 5th in Forbes’ richest Filipinos. Do you think that Aquino’s officials who made possible such a colossal income for a private firm will be getting just Christmas baskets from it? APO-PU chairman Milagros Alora and the firm’s board of trustees which set up the dubious JV with UGEC that had the monopoly to print the new e-passports. The other members of the board were Amando Dimacurot (also its president and CEO), Jaime Aldaba (its general manager), Allan Capulong, Cecilia Manikna, Luz Rodriguez, and Victor Signey. Alora had been the late Cory Aquino’s assistant press secretary, and was reportedly close to one of the most powerful figures in that regime and in Aquino 3rd’s Maria Montelibano; and PCOO secretary Herminio Coloma Jr., who allegedly lobbied for the DFA to give APO-PU the printing contract (which was sub-contracted in effect to UGEC) and who at the very least, could have stopped the deal as he was the agency’s supervisor. That is totally false, with the COA — whose reports he should have read the day he assumed office — pointed out that APO has only six personnel at the plant producing the passports which has a staff of over 500. The APO-PU also has only one representative in the JV’s six-man executive board. And if UGEC ‘’only helps,” why would it get 90 percent to 70 percent of the plant’s profits? What a country. The Philippine passport is the prime document identifying a person as a citizen of this republic. Yet it is turning out to be the biggest instance of government corruption ever. Main sources of data for this column are downloadable by anyone at www.coa.gov.ph: Commission on Audit’s annual audits of APO Production Unit for 2015, 2016 and 2017.